PARIS, March 17. /TASS/. French authorities have taken into custody nearly 200 participants of Saturday’s Yellow Vest protests in Paris, which saw hours-long clashes between the law enforcement personnel and aggressive demonstrators, BFM TV channel reported citing prosecutors. 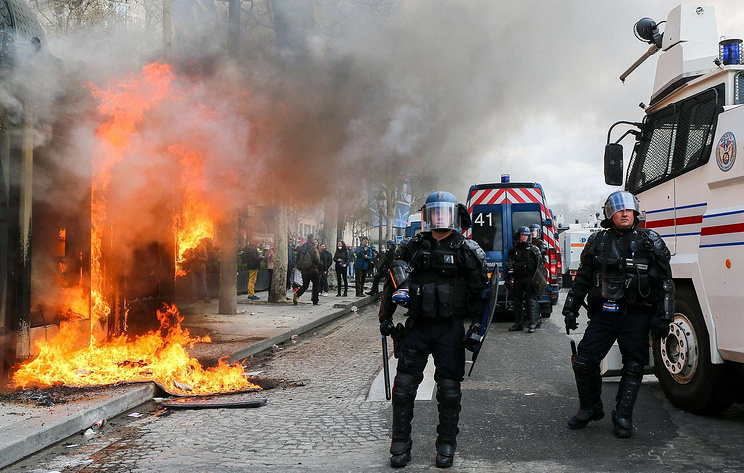 According to the latest data, some 237 protesters were hauled off in Paris on Saturday. Some of them were released that night, and another 200 have been arrested, including 15 underage persons. Among the protesters were nearly 100 members of well-known far-left groups, while most rioters were radically-minded representatives of the Yellow Vest movement, police said. On March 16, the 18th wave of Yellow Vest protests engulfed France. The largest riots and clashes occurred in Paris on that day. Their epicenter was the Avenue des Champs-Elysees, where aggressive demonstrators crashed and set on fire dozens of shops, cafes and newspaper stands. Seventeen law enforcement personnel and 42 demonstrators were hurt during the protests. No incidents were reported in other cities, including Lille, Marseille and Toulouse, police said.